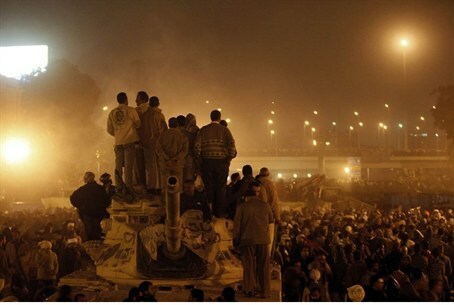 Unknown assailants attack demonstrators near Cairo's presidential palace, injuring 14. Unknown assailants using firearms and Molotov cocktails attacked peaceful demonstrators staging a sit-in near Cairo's presidential palace on Saturday, Al-Ahram reports. At least 14 people were injured. No deaths were reported. According to Al-Ahram, the perpetrators torched four of the tents set up by protesters in the vicinity of the palace, which has been a prominent venue for demonstrations against President Mohammed Morsi the past couple of months. Violence extended to surrounding streets, prompting traffic congestion for a short while before the situation was contained, the report said. Karim El-Shaer, one of the protesters taking part in the sit-in, told Nile Live TV that around 30 "thugs" had assaulted demonstrators and fired rounds in the air to terrorize them. He also claimed that earlier in the day, military police had tried to coax protesters into leaving but to no avail. Al-Ahram quoted an anonymous official at the presidential palace as saying that Morsi and all presidential staffers had left the palace before turmoil broke out. "Most presidential officials knew about the incident from the media," he stated. In an official statement, the ministry of health said 11 people were transferred to the nearby Cleopatra Hospital, while three more were taken to Heliopolis Hospital. Saturday's attack on the sit-in was not the first. On December 5, clashes erupted at the presidential palace after supporters of President Morsi arrived at the scene to lock horns with demonstrators. At least 10 were killed from both camps. The sit-in was first staged mainly in protest against a temporary presidential decree that was issued in November, and for a short while put Morsi beyond legal accountability. Protesters at the palace, who were in thousands at the time, also called for the postponement of the constitutional referendum, which eventually took place in December as scheduled and saw around 64 percent of voter turnout endorse the national charter. Egypt's opposition has said it will appeal the referendum results, saying polling "fraud and violations" skewed the results of the two-stage referendum.